One of the biggest distinctions that I see between Bernie Sanders and Hillary Clinton is that Bernie is all about we the people, where Hillary is all about better positioning herself in a place of power. For example, during opening statements at one of the Democratic Presidential Debates, Bernie started off with “when WE win”. Hillary, on the other hand, started off with “when I win”. It is a subtle, single word detail, but it matters. Here are some of the reasons that I believe that Bernie Sanders is The People’s Presidential Candidate and why I am voting for him. Bernie Sanders has had a 30+ year political career. Throughout his political career, he has fought for voting rights, civil rights and income equality. He has consistently been working to better out country and continues to do so with his calls for a political revolution to fix our “rigged economy. There aren’t many politicians throughout history that can have not flip flopped the change their political stance to pander to their constituents. Bernie Sanders refuses to do so. Bernie Sanders has not and will not take money from corporate campaign donors and he refuses to use a Super PAC. The small individual donations from the American people are his financial backing. Corporate campaign donations have a significant impact on politicians and their decisions. Bernie knows this, and by refusing to take corporate campaign donations or setup a Super PAC, he is beholden to the only people that matter, the American people. This has inspired many Americans to start up a major Grassroots Movement that is quickly turning into a Political Revolution. 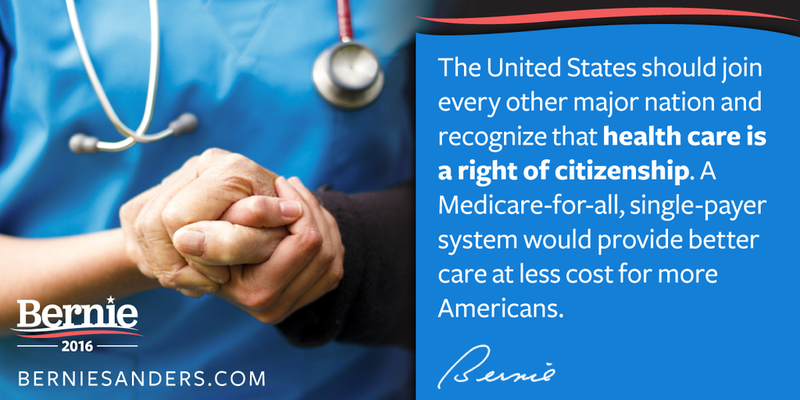 Bernie Sander believes, like a great majority of Americans, that health insurance should be a basic human right, not a privilege. There are far too many people who need medical attention that aren’t getting it because they can’t afford the cost. While the cost of Medicare for All has a steep cost, the saving from not having to pay insurance premiums and deductibles will more than offset it. This has been proven many times by multiple prominent economists have backed Bernie’s plan. Bernie’s plan would save the average family between $505 to $1,823 a year. As a middle class American, I would rather pay a flat tax for insurance so everyone can be covered. Education is the life-blood of economic and social progress. Back when I was in school, a high school education was pretty much required to make anything with your life. Today, things have changed. Now, a college education is required. My son will be starting college this year. He is applying for scholarships and grants, but these will not be enough to pay for all of his education. I will, more than likely, have to take out a significant loan to pay for his education. 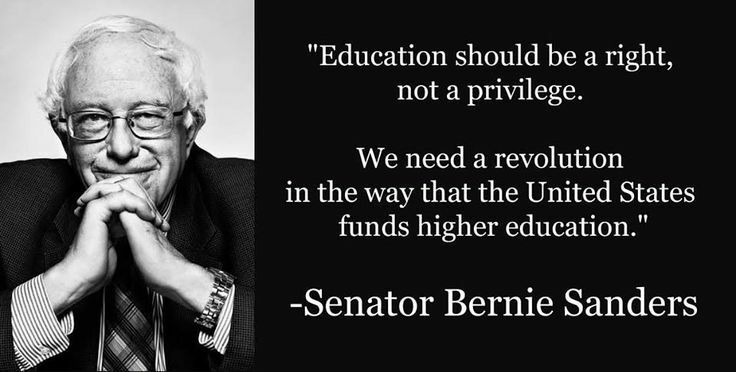 Providing tuition-free public college will boost the economy and assure that The United States has a workforce that can compete effectively in the twenty-first-century global marketplace. Bernie Sanders has successfully won 14 elections (most of which were framed as unwinnable). He has held office for 30+ years. 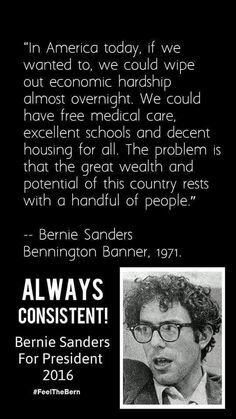 Bernie is also the longest serving Independent politician in Congress and holds the highest approval rating of any United States Senator in Vermont. With Bernie surging in the polls in New Hampshire (+27 points ahead of Hillary Clinton at last glance) and pulling ahead of Hillary Clinton in Iowa (+8 points at last glance), to say that Bernie is not electable, it just plain false. Bernie Sanders is the only candidate that has spoken out, screaming it from on high at times, against Big Corporations, Big Pharmacology, Wall Street, The Kock Brothers and the rest of the 1%. He wants to close the tax loopholes and make these people and corporations pay their fair share. America’s Middle and Lower Classes needs someone in office who is not afraid to stand up to the billionaire class and return our government to every single American, not just the wealthy. Every other candidate running have been bought and paid for by the billionaire class, including Hillary Clinton. 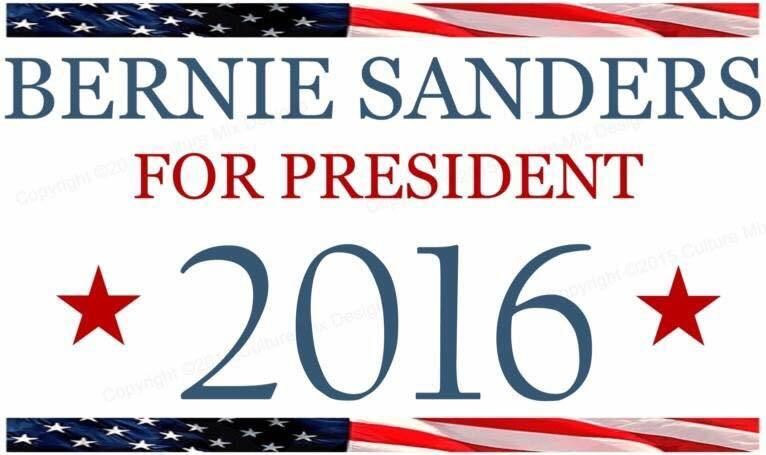 To think that any of the other candidates will take the stance that Bernie is is naive at best. Bernie Sanders, and the rest of the Democratic candidates, acknowledge that Climate Change. 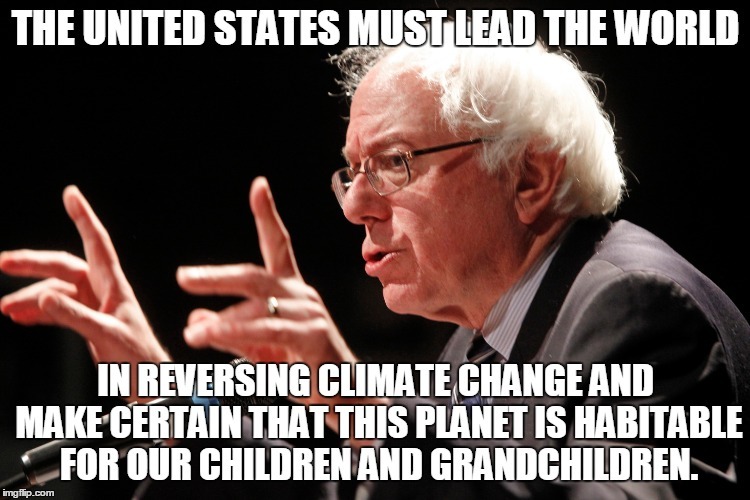 Bernie also realizes that Climate Change is caused in part by our dependence on fossil fuels and has a plan to transfer us to cleaner, renewable alternatives. This is an important issue for me, as I want to leave a planet that my son and future grandchildren can inhabit. Bernie, like President Barack Obama, isn’t looking to take away everyone’s firearms. 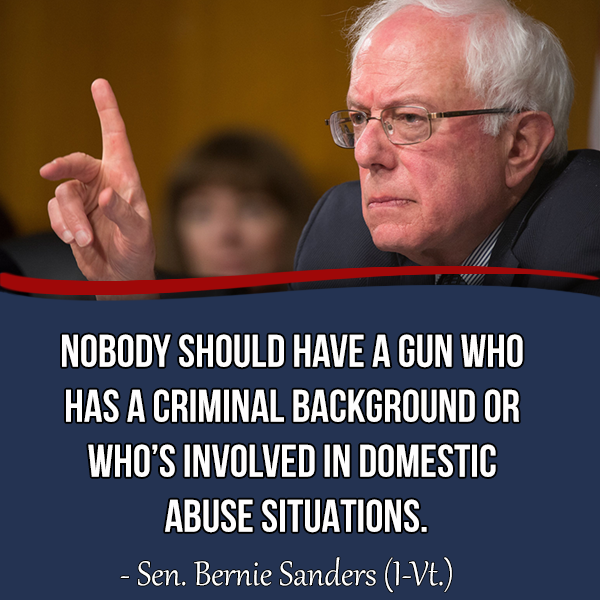 Bernie wants to implement stricter background checks and eliminate the gun show loopholes to prevent the mass shootings (more than 1 a day in 2015) that have become all to familiar in America. Even a good number of responsible gun owners acknowledge that we need comprehensive gun reform. It is insane how easy it is to buy a gun these days. Even people on no fly lists can acquire a gun. I do believe that there is a place in society for firearms, but I do not believe that assault weapons have a roll except for military personnel. If the average gun enthusiast wants to use an assault weapon join the military. Unfortunately, the National Rifleman’s Association (NRA) has far too much power in our politics. A Political Progressive Revolution is needed in America. Getting Bernie Sanders to the White House isn’t enough. We must continue to educate people and push for progressive political changes on the local, state and federal levels. 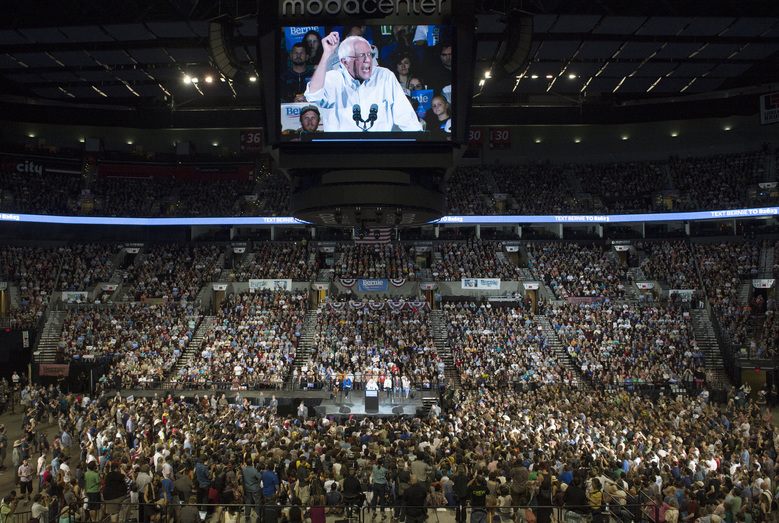 If we stop at just getting Bernie in the White House and don’t push for changes in Congress and at the state and local levels, we will be in the same position we are currently, with a president that has a bright vision for our future and a Congress that will do everything in their power to obstruct progress and push us backwards. I for one believe that we need to take back our country and move forward. To do this, we need a Political Progressive Revolution. The future of our country depends on it. 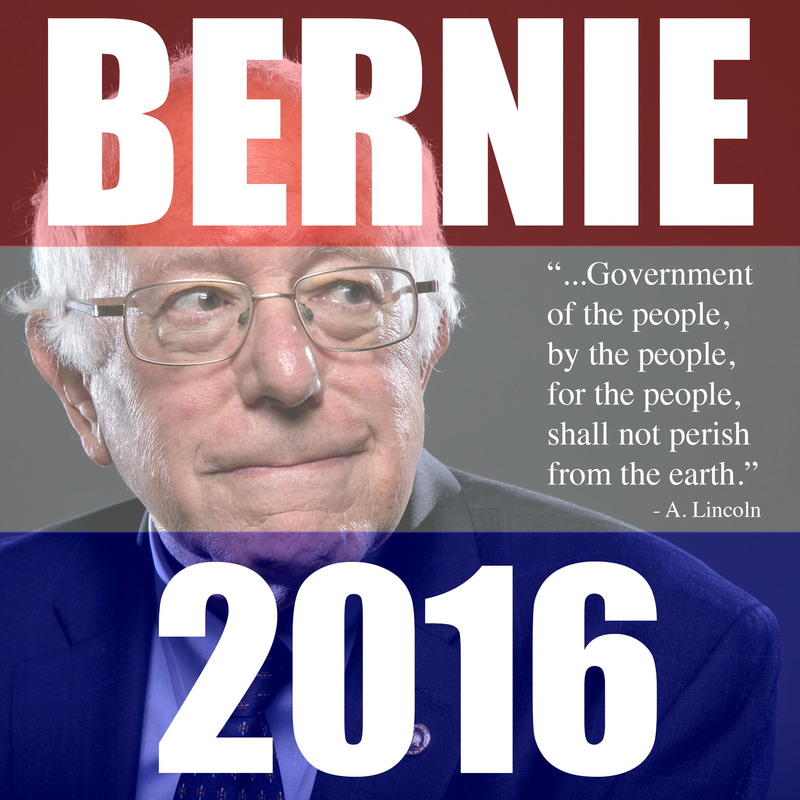 Bernie Sanders has altered my perception of politics and government. The fight he is fighting is inspiring and exciting. Regardless of the outcome, I’m proud to be part of the Feel The Bern Movement and I’m proud to support a man who flies coach and runs to catch his train. 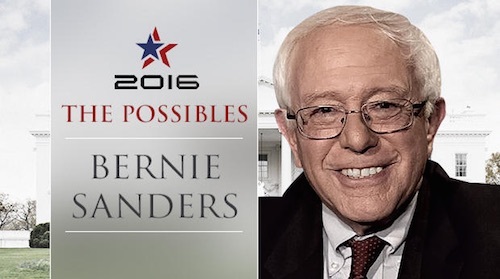 Bernie Sanders a man who sincerely wants to make America better. ← Sarah Palin. Hopefully, the death of Donald Trump’s presidential campaign.